Um…I was supposed to participate in Readathon yesterday. I haven’t participated in quite some time, and I was looking forward to it this fall. I knew it was going to be hectic, and busy, because yesterday was my oldest son’s 14th birthday. Originally, I wasn’t even going to sign up, with the whole birthday thing going on. But then Morrigan wanted to sign up, and asked if he could spend most of his birthday doing Readathon, and so I said sure, we can do that. That was cool…except then yesterday morning came, and he decided he didn’t want to do Readathon after all. Oops. I thought about doing some reading anyway, but in the end, it wasn’t worth it. We had lots of party stuff to get together. Things to cook. Games to plan. Etc. I spent the day with my family instead of with a book, and that’s totally okay, I think. I just kinda feel bad since I signed up and then bailed. Especially because I did the same thing in April (except in April, I bailed because I had an all-day write-a-thon instead), and I didn’t even sign up for either Readathon in 2013. It’s been two years now since I participated. So…April. I’m looking at you. It’s long past time for me to rejoin my fellow book-people. 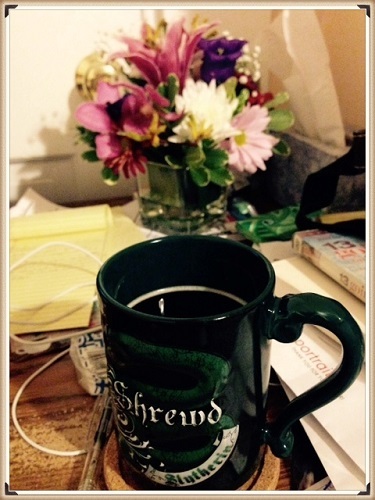 This entry was posted in Book Talk and tagged readathon, Sunday Coffee. Bookmark the permalink. It has been ages for me too and like you I am ready and waiting for April. I shall give M to a grandma for the day and night and not feel guilty about it.